06/09/18 New video added to the main page about a line lock or trans brake indicator light wiring idea. 04/28/18 New video added to the main page about The Oldsmobile Omega. 04/14/18 New video added to the main page about The Pontiac Ventura and Phoenix. 01/28/18 New video added to the main page about Nova Rear Axles. 01/21/18 New video added to the main page about The Rally packages for the Nova. 01/14/18 New video added to the main page about Old-School taillight blue dots. 01/07/18 New video added to the main page about Rare vs Valuable Nova Options. 12/31/17 New video added to the main page about Nova In-Dash Tachs. 12/24/17 New video added to the main page about Winter Storage Tips. 12/22/17 Added ACC codes to the the 1962 cowl tag page. 12/17/17 New video added to the main page about How to tell if you have a Nova SS. 12/10/17 New video added to the main page about Nova Fender Louvers. 12/03/17 New video added to the main page about Chevy II vs Nova Names. 11/24/17 New video added to the main page about Decoding 1962 Nova Cowl Tags. 11/18/17 New video added to the main page about Chevy Nova Generations. 11/02/17 Revised NovaResource graphic. Added links to NovaResource Instragram page and NovaResource YouTube Page. 12/01/05 Volume 5, Issue 12 of Scott's Rants and Raves page. Added pictures to the 1963, 1967, 1970, 1971, 1972, 1973 and 1975 galleries. 11/01/05 Volume 5, Issue 11 of Scott's Rants and Raves page. Added pictures to the 1962, 1963, 1965, 1966, 1967, 1968, 1969, 1972, 1973, 1975, 1976, 1977, 1978 and Non-Novas galleries. 10/01/05 Volume 5, Issue 10 of Scott's Rants and Raves page. Added pictures to the 1965, 1966, 1967, 1968, 1972, 1977, 1978 and Non-Novas galleries. 09/01/05 Added pictures to the 1965, 1966, 1967, 1972, 1973, 1975, 1976 and 1978 galleries. 08/01/05 Volume 5, Issue 8 of Scott's Rants and Raves page. Added pictures to the 1964, 1965, 1970, 1973, 1974, 1976 and 1977 galleries. 07/01/05 Volume 5, Issue 7 of Scott's Rants and Raves page. Added pictures to the 1962, 1964, 1969 and 1973 galleries. 06/01/05 Volume 5, Issue 6 of Scott's Rants and Raves page. Added pictures to the Non-Novas gallery. 05/01/05 Volume 5, Issue 5 of Scott's Rants and Raves page. Moved all the Non-Nova links to their own Non-Nova Links page. Added pictures to the 1966, 1969, 1975, 1976, 1977, 1978 and Non-Novas galleries. 04/01/05 Volume 5, Issue 4 of Scott's Rants and Raves page. Added pictures to the 1966, 1970, 1975 and 1977 galleries. 03/01/05 Volume 5, Issue 3 of Scott's Rants and Raves page. Added pictures to the 1967, 1968, 1969, 1970 and 1973 galleries. 02/01/05 Volume 5, Issue 2 of Scott's Rants and Raves page. Added pictures to the 1966, 1967, 1970, 1972, 1973, 1974, 1975 and 1978 galleries. 01/01/05 Volume 5, Issue 1 of Scott's Rants and Raves page. Added pictures to the 1963, 1966, 1967, 1970, 1971, 1972, 1973, 1974 and 1977 galleries. 12/01/04 Volume 4, Issue 12 of Scott's Rants and Raves page. 11/01/04 Volume 4, Issue 11 of Scott's Rants and Raves page. Added pictures to the 1963, 1966, 1967, 1969, 1970 and 1972 galleries. 10/01/04 Volume 4, Issue 10 of Scott's Rants and Raves page. Added pictures to the 1965, 1969, 1970, 1971, 1972, 1973, 1974, 1975 and 1977 galleries. 09/01/04 Volume 4, Issue 9 of Scott's Rants and Raves page. Added the RPO-U17 Special Instrumentation Package page. Updated the RPO-F41 Special Performance Front & Rear Suspension page. Updated the RPO-YF1/Z26 Rally Package page. Added pictures to the 1963, 1966, 1971, 1975 and 1978 galleries. 08/01/04 Volume 4, Issue 8 of Scott's Rants and Raves page. Added pictures to the 1966, 1967, 1973, 1978, 1979 and Non-Nova galleries. 07/01/04 Volume 4, Issue 7 of Scott's Rants and Raves page. Added pictures to the 1966, 1971, 1972, 1975, 1976 and 1978 galleries. 06/01/04 Volume 4, Issue 6 of Scott's Rants and Raves page. Added pictures to the 1966, 1968, 1973 and Non-Nova galleries. 05/01/04 Volume 4, Issue 5 of Scott's Rants and Raves page. Added pictures to the 1964, 1969, 1970, 1972, 1973, 1972 and 1975 galleries. 04/01/04 Volume 4, Issue 4 of Scott's Rants and Raves page. Changed the email address used for communication. All email sent to administrator@novaresource.com will be deleted. Added pictures to the 1962, 1963, 1966, 1971 and 1977 galleries. 03/01/04 Volume 4, Issue 3 of Scott's Rants and Raves page. Added pictures to the 1965, 1966, 1970, 1972, 1973 and Non-Nova galleries. 02/13/04 Volume 4, Issue 2 of Scott's Rants and Raves page. Added pictures to the 1962, 1968, 1969, 1970, 1972, 1973, 1974, 1976, and Non-Nova galleries. 01/13/04 Volume 4, Issue 1 of Scott's Rants and Raves page. Added pictures to the 1963, 1965, 1966, 1967, 1969, 1971, 1972, 1973, 1974, 1975, 1976 and 1977 galleries. 12/01/03 Volume 3, Issue 12 of Scott's Rants and Raves page. Added pictures to the 1963, 1967, 1969, 1970, 1972, 1976 and 1977 galleries. 11/01/03 Volume 3, Issue 11 of Scott's Rants and Raves page. Added pictures to the 1963, 1966, 1967, 1969, 1970, 1972, 1973, 1974, 1976, 1977, 1978, 1979 and non-Nova galleries. 10/01/03 Volume 3, Issue 10 of Scott's Rants and Raves page. Added pictures to the 1962, 1963, 1965, 1967, 1969, 1972, and 1973 galleries. 09/01/03 Volume 3, Issue 9 of Scott's Rants and Raves page. Added pictures to the 1963, 1967, 1970, and 1976 galleries. 08/01/03 Volume 3, Issue 8 of Scott's Rants and Raves page. Added pictures to the 1965, 1966, 1967, 1972, 1974, and 1976 galleries. 07/01/03 Volume 3, Issue 7 of Scott's Rants and Raves page. Added pictures to the 1964, 1971, and 1974 galleries. 06/01/03 Volume 3, Issue 6 of Scott's Rants and Raves page. Added pictures to the 1973, 1974, 1976, and Non-Nova galleries. 05/01/03 Volume 3, Issue 5 of Scott's Rants and Raves page. Added pictures to the 1962, 1964, 1965, 1970, 1973, 1975, and 1979 galleries. 04/01/03 Volume 3, Issue 4 of Scott's Rants and Raves page. Created new page to describe the RPO-F41 Special Performance Front & Rear Suspension. Added pictures to the 1969, 1973, 1975 and 1976 galleries. 03/01/03 Volume 3, Issue 3 of Scott's Rants and Raves page. Added pictures to the 1967, 1970, 1971, 1972, 1973, 1974, 1976 and 1978 galleries. 02/01/03 Volume 3, Issue 2 of Scott's Rants and Raves page. Added pictures to the 1962, 1963, 1967, 1971, 1975, 1976, and 1977 galleries. 01/01/03 Volume 3, Issue 1 of Scott's Rants and Raves page. Added pictures to the 1968, 1971, 1973, 1974 and 1976 galleries. 12/01/02 Volume 2, Issue 12 of Scott's Rants and Raves page. Added pictures to the 1965, 1967, 1968, 1971, 1973, 1975, 1976 and Non-Nova galleries. 11/01/02 Volume 2, Issue 11 of Scott's Rants and Raves page. Added pictures to the 1966, 1968, 1974, 1976 and 1979 galleries. 10/01/02 Converted all pages to display best on 1024x768 resolution. Volume 2, Issue 10 of Scott's Rants and Raves page. Added pictures to the 1962, 1966, 1967, 1970, 1971, 1973 and 1975 galleries. 09/01/02 Volume 2, Issue 9 of Scott's Rants and Raves page. Added pictures to the 1963, 1967, 1968, 1970, 1971, 1974 and 1976 galleries. 08/01/02 Volume 2, Issue 8 of Scott's Rants and Raves page. Added pictures to the 1962, 1966, 1967, 1968, 1972, 1973, 1978 and Non-Nova galleries. 07/01/02 Volume 2, Issue 7 of Scott's Rants and Raves page. Added pictures to the 1962, 1966, 1971, 1973 and 1975 galleries. 06/01/02 Volume 2, Issue 6 of Scott's Rants and Raves page. Added pictures to the 1963, 1965, 1966, 1968, 1970, 1973, 1975, 1976, 1977 and 1978 galleries. 05/15/02 Revised the Super Sport and Spirit of America Nova pages. Created new pages to describe the Nova Custom/Concours, RPO-AB8 Cabriolet Formal Roof, RPO-BW6 Custom Appearance Group, RPO-YF1/Z26 Rally Package, RPO-ZJ1 Custom Interior Package, RPO-ZJ2 Custom Exterior Package, RPO-ZJ3 Interior Convenience Package, RPO-ZJ5 Exterior Decor Package, RPO-Z11 LN Package and RPO-Z54 Interior Decor/Quiet Group options. 05/01/02 Volume 2, Issue 5 of Scott's Rants and Raves page. Added pictures to the 1966, 1969, 1971, 1972 and 1977 galleries. 04/01/02 Volume 2, Issue 4 of Scott's Rants and Raves page. Added 1964 values to the Nova Exterior Dimensions and Nova Weights pages. Added pictures to the 1965, 1966, 1970, 1971, 1972, 1974 and Non-Nova galleries. 03/06/02 Volume 2, Issue 3 of Scott's Rants and Raves page. Added pictures to the 1963, 1967, 1970, 1971, 1972, 1973, 1974 and 1977 galleries. 02/01/02 Volume 2, Issue 2 of Scott's Rants and Raves page. Added pictures to the 1963, 1966, 1973, 1974 and 1975 galleries. 01/25/02 Added thumbnails of the exterior paint colors on all Cowltags pages. 01/18/02 Added new Nova Exterior Dimensions page. 01/08/02 Revised the main page moving the links for the Scott's Rants and Raves page and the NovaResource.com Store to the header and moving the links for The Nova Listserv and Steve McNabb's Chevy II Nova Q&A page to tabs at the bottom of the page. Also a link to the The GMForums.com X-Body Bulletin Board was added to the bottom. 01/01/02 Volume 2, Issue 1 of Scott's Rants and Raves page. Added pictures to the 1963, 1966, 1967, 1973, 1976, 1977 and 1978 galleries. 12/01/01 Volume 1, Issue 6 of Scott's Rants and Raves page. Added an alternate wiring method to the Remote Starter Solenoid Install page. Added pictures to the 1962, 1966, 1969, 1972, 1973 and 1976 galleries. 11/01/01 Volume 1, Issue 5 of Scott's Rants and Raves page. Added pictures to the 1966, 1969, 1971, 1972, 1973, 1974, 1975, 1976 and Non-Nova galleries. 10/20/01 New pics of my car were added and the main picture changed. 10/02/01 Due to the large number of cars in the Nova gallery I replaced the 4 generation gallery pages with 18 year specific pages and one page for all Non-Nova cars. 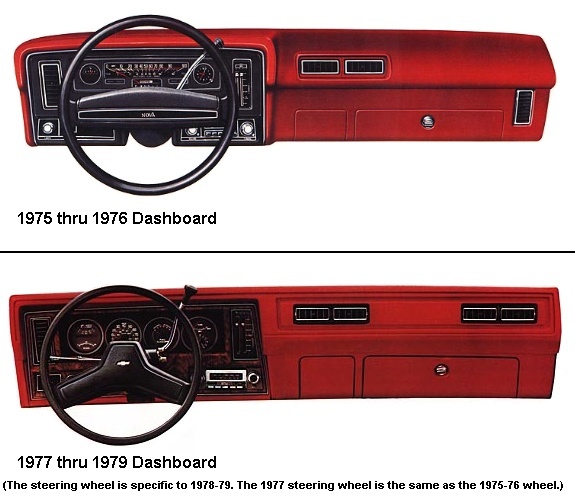 I've also moved the links to the pages about my 1976 Nova from the top of the main page to inside the pic of my Nova on the main page. 10/01/01 Volume 1, Issue 4 of Scott's Rants and Raves page. Added pictures to the 1st Generation Nova Gallery, the 2nd Generation Nova Gallery, the 3rd Generation Nova Gallery and the 4th Generation Nova Gallery. 09/27/01 Added new transmission production numbers to the Production Numbers page. 09/11/01 Our prayers go out to all that suffered loss in the attacks against our country. God Bless America! 09/05/01 Revised Nova Info menu on left of main page by adding link to Ray McAvoy's 1962-79 Nova Body Panel Interchange page and moving the links for Steve McNabb's Chevy II Nova Q&A page and Bruce Johnson's Nova Tire Fitment page from the Techincal Info menu. Added new links to the Technical Info menu to Alex Bilan's Alternator Conversion and HEI Conversion pages. 09/01/01 Volume 1, Issue 3 of Scott's Rants and Raves page. Added pictures to the 1st Generation Nova Gallery, the 2nd Generation Nova Gallery, the 3rd Generation Nova Gallery and the 4th Generation Nova Gallery. 08/07/01 Added option code K (C60 Air Conditioning) to the 2nd option group codes on the 1965, 1966 and 1967 cowl tag pages. 08/01/01 A totally new main page and revised all other pages. Volume 1, Issue 2 of Scott's Rants and Raves page. Created the Rants and Raves Archive page. Added pictures to the 1st Generation Nova Gallery and the 3rd Generation Nova Gallery. 07/13/01 Added new numbers to the Production Numbers page and added new codes to the Axle Codes page. 07/01/01 Created the Scott's Rants and Raves page. Added pictures to the 3rd Generation Nova Gallery and the 4th Generation Nova Gallery. 06/01/01 Added pictures to the 2nd Generation Nova Gallery, the 3rd Generation Nova Gallery and the 4th Generation Nova Gallery. 05/01/01 Added pictures to the 1st Generation Nova Gallery, the 3rd Generation Nova Gallery and the 4th Generation Nova Gallery. 04/01/01 Added pictures to the 2nd Generation Nova Gallery, the 3rd Generation Nova Gallery and the 4th Generation Nova Gallery. 03/24/01 Added new Alternator Conversion page. 03/20/01 Updated the table of standard Nova gear ratios on the Axle Codes page to show standard ring gear size. 03/01/01 Added pictures to the 1st Generation Nova Gallery, the 2nd Generation Nova Gallery and the 3rd Generation Nova Gallery. 02/01/01 Added pictures to the 1st Generation Nova Gallery, the 2nd Generation Nova Gallery, the 3rd Generation Nova Gallery and to the 4th Generation Nova Gallery. 01/10/01 Added pictures to the 3rd Generation Nova Gallery and to the 4th Generation Nova Gallery. 01/01/01 Revised the main page, the Nova Ads page and the Nova Gallery page, by making the images smaller. I hope you find they now load quicker. 12/19/00 Added links to Pat Mancuso's 1962-67 Nova Disc Brake Swap page, Alex Bilan's 1968-74 Nova Disc Brake Swap page and Bruce Johnson's Nova Tire Fitment page to the main page. 12/16/00 Added pictures to the 4th Generation Nova Gallery. 12/12/00 Added 1965 Nova weights to the Weights page. 11/22/00 Joined with CafePress.com to create the NovaResource.com Store where you can buy shirts, mugs and mouse pads with the NovaResource.com logo on them. Added pictures to the 1st Generation Nova Gallery, the 2nd Generation Nova Gallery, the 3rd Generation Nova Gallery and to the 4th Generation Nova Gallery. 11/01/00 Created the Super Sport Package page. Added pictures to the 2nd Generation Nova Gallery, the 3rd Generation Nova Gallery and to the 4th Generation Nova Gallery. 10/27/00 Added a table of standard Nova gear ratios to the Axle Codes page. 10/01/00 Added pictures to the 1st Generation Nova Gallery, the 2nd Generation Nova Gallery, the 3rd Generation Nova Gallery and to the 4th Generation Nova Gallery. 09/01/00 Added pictures to the 1st Generation Nova Gallery, the 2nd Generation Nova Gallery, the 3rd Generation Nova Gallery and to the 4th Generation Nova Gallery. 09/12/00 The Nova WebRing has been closed due to a change in ownership of the webring.org system. Yahoo.com took over operation of the webring system and I was not pleased with the new way it is being operated. It forced webring members to first join Yahoo.com before joining a webring. After nearly 3 years of work on the Nova WebRing it saddens me to shut down but I didn't feel it was right to force people to join Yahoo.com if all they wanted to do was be a part of the Nova WebRing. I want to thank all members who made the Nova webring the #23 most popular Automotive webring (out of hundreds) in the webring.org system. 08/01/00 Added pictures to the 3rd Generation Nova Gallery and to the 4th Generation Nova Gallery. 07/07/00 Added pictures to the 1st Generation Nova Gallery, the 2nd Generation Nova Gallery, the 3rd Generation Nova Gallery and to the 4th Generation Nova Gallery. 07/05/00 Added pictures to the 1st Generation Nova Ads, the 2nd Generation Nova Ads, the 3rd Generation Nova Ads and to the 4th Generation Nova Ads. 06/15/00 Added pictures to the 1st Generation Nova Ads, the 2nd Generation Nova Ads, the 3rd Generation Nova Ads and to the 4th Generation Nova Ads. Added links to the Nova Links page. 06/01/00 Added pictures to the 1st Generation Nova Gallery and to the 3rd Generation Nova Gallery. 05/09/00 Added Transmission Codes page. 04/24/00 Added pictures to the 1st Generation Nova Gallery, the 2nd Generation Nova Gallery, the 3rd Generation Nova Gallery and to the 4th Generation Nova Gallery. 03/24/00 Added pictures to the 1st Generation Nova Gallery, the 3rd Generation Nova Gallery and to the 4th Generation Nova Gallery. 03/20/00 Added 1963 and 1967 values to the Nova Weights page. 02/27/00 Added new CalTrac Bars page. 02/18/00 Added pictures to the 1st Generation Nova Gallery and to the 3rd Generation Nova Gallery. 02/08/00 Added RPO codes page for 1962-1967 Novas. 02/02/00 Revised the Bulletin Boards page, revised the Links page and added links to the Nova Links page. 01/31/00 Revised the Nova Ads page. 01/28/00 Revised the Nova Gallery page. 01/26/00 Added new Nova Weights page. 01/22/00 Added new figures to the Production Numbers page. 01/13/00 Added pictures to the 3rd Generation Nova Gallery. 12/27/99 Revised the main page and added Site Map page. 12/24/99 A totally new main page and revised all other pages. 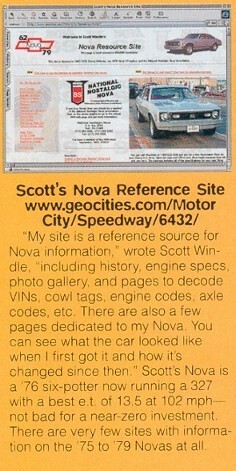 12/14/99 Revised the main page, added link to the writeup of NovaResource.com in the January, 2000 issue of Car Craft magazine, added pictures of 4th generation dashboards and the 1975 Nickey Nova to the Nova History page. 12/01/99 Revised the main page, added this What's New page.